There is an episode of Star Trek The Next Generation entitled "Darmok." The set up is that the Enterprise meets an alien race with which humanity has never been able to communicate. The humans have a "universal translator," which means that they can understand the words that the aliens say. But they can't comprehend their meaning. Why not? Because the aliens only communicate through allusion. Instead of saying something directly, they use metaphors based in the common narratives of their culture. So, instead of saying "I am having romantic feelings" they would say something like "Juliet on the balcony." The captain of the alien ship teaches Captain Picard how to communicate by forcing him to have a shared experience, a fight together against a common enemy. While working together, Picard comes to understand how the other captain communicates. Of course, the biggest problem that the humans are going to have in talking to these aliens is that they don't have common stories. 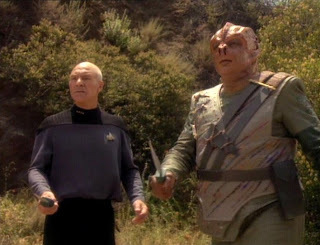 So, when the alien says "Darmok and Jalad at Tanagra," he means that two heroes must fight for a common goal. Unfortunately, the humans don't know that story, so they have no reference point for what the aliens are trying to say. I recognize how increasingly like these aliens I am. I was sitting in a meeting a few weeks ago. The person leading the meeting was talking about "spiritual formation." That's kind of a buzz word in the church world right now. He had lots to say about this topic, and what he had to say was very well thought out. I, however, had a hard time understanding what he was saying. Why? Because he didn't use any stories. There were not examples, no parables, no narrative. Because there was no narrative, no "Darmok and Jalad at Tanagra," no "Juliet on her Balcony," I couldn't grasp the material. I understood every word he was saying, but the words were like vapor in a disembodied haze. I find the same thing to be true when I watch movies. I love movies, but one of the things that makes me hate certain movies is their lack of narrative structure. Take "Babies," a sort of documentary that follows the first year in the life of four newborns. It is cute, it is sometimes beautiful to look at, and it gave me an appreciation of some of the different ways people raise babies around the world. However, I hated the movie and was ready for it to be over 15 minutes in. Why? Because the narrative was so weak, really non-existent. Clint Eastwood's latest "Hereafter" also struggled to have a real narrative structure, putting it on my "bad list." Then there was Transformers 2 which, apart from terrible acting, had a maddening lack of narrative continuity. Therefore it sucked. All of this leads me to a greater point. I think about the people who are outside of the Church, those who don't know the great stories of the Bible or of Church History. They come into our church, and we might as well be talking about Darmok and Jalad at Tanagra. We have common narratives within Christianity, but for those outside I would assume that these can be hard to connect with. If I were a "seeker sensitive" guy, I would say that the solution to this is to stop using Biblical narratives. Instead, I would rely on movie clips and pop songs. Another way I could respond would be to just not worry about those people. I'll just use my church language, my "Christianese," and they can just figure it out or not. I don't wish to accept either of those options. I believe it is essential to maintain our stories, we just have to do a better job of teaching the Grand Narrative to those on the outside. We have to be careful to use language that invites them in, while recognizing that there simply is no slang word that can substitute for "propitiation." I think the best way to do this is to tell the Grand Narrative each and every Sunday, which is in fact what we do in the Anglican tradition. Through our Eucharistic liturgy (two Church words to be sure! ), we tell the story of the God who took on flesh, was born, lived, taught, suffered, died, rose, ascended, sent the Spirit, and promised to return. I'm not talking about what we say in the sermon, I'm talking about the entire movement of worship. I am a person who loves good stories. I love to read them, hear them, watch them, and tell them. Most of all, I love the story of Jesus and I long to tell that story over and over again until the whole world has heard.